If she was flattered, she certainly didn't show it. 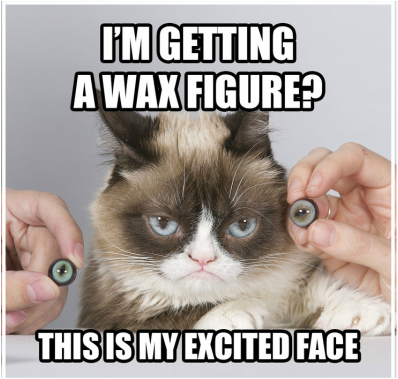 "This is truly an honor," Grumpy Cat said when she learned she'll be the first cat ever to have a wax figure at Madame Tussauds. "I hate it." To understand why, just take a look at this video of her working with Madame Tussauds' figure sculptors. so how she turned out looking like a Ragdoll or Snowshoe is anybody's guess. Her grumpy face is due to an underbite and feline dwarfism, not attitude. Oh, and she's not the only grumpy looking cat in her family. She has a brother named Pokey, who also has dwarfism and an underbite. Tardar and Pokey live in Arizona with Tabatha Bundesen, who was a server at Red Lobster until her cat began producing way more income than she was. Grumpy Cat sells licensed merchandise, wrote a book, starred in a movie and stays busy appearing at events and doing commercials, including some for Friskies and Honey Nut Cheerios. She didn't like the Cheerios. While this may seem like no life for a cat, Bundesen says most of the time, she's just a "normal kitty." She likes to play with bags and string and hide behind the curtains. Tardar Sauce became the Queen of cat Memes soon after Bundesen's brother, Bryan, posted a picture of her stunningly grumpy-looking kitten on Reddit. 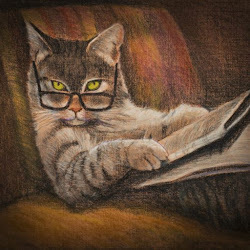 When viewers suggested no cat could possibly look that grouchy and the picture was Photoshopped, Bundesen put two videos on You Tube. The videos went viral, and within days, Grumpy Cat was an Internet star. She'll unveil her sculpture at Madame Tussauds in San Francisco later this year. After a short stay in San Francisco, the sculpture, but maybe not the cat, will visit other Madame Tussauds' locations in Hollywood, Las Vegas, New York, Orlando and Washington, DC.